Laurie Neef and Trent Cannon with Maura & Jim Lee of Piggy Q, winners of the fish contest. I’ve been scrolling through dozens of galleries and photos trying to find a great picture of this year’s contest t-shirt. Every single one has credentials, people, beverages, body parts, or something else obstructing the artwork. Apparently we were way too busy to stage any photos. The one above, showing Maura & Jim Lee of Piggy Q, winners of the fish contest, is the best I can do. Thanks for modeling, Trent! 1. Follow us on Facebook , Twitter, and/or Instagram and share this post. If you’re already a follower, simply leave a message or tweet us. 2. Comment below and tell us about your favorite barbecue t-shirt and why you want to win this one. Or, better yet, tweet/Instagram a pic! Be sure to tag us. 3. You may comment only ONCE. 4. Winner will be chosen at random from all eligible entries. Contest ends at 12 noon Monday, October 7, and we’ll announce the winner on Wednesday, October 9. If you don’t like your odds and you want instant gratification, click here to buy one. Sizes Small through 4XL. Limited edition; get’em while they’re hot! Last year we contracted with Big Muddy Brewing to develop our own beer. We wanted a craft brew that would be unique to us and complement our barbecue. Who better to capture the flavor than our local, award-winning craft brewery? 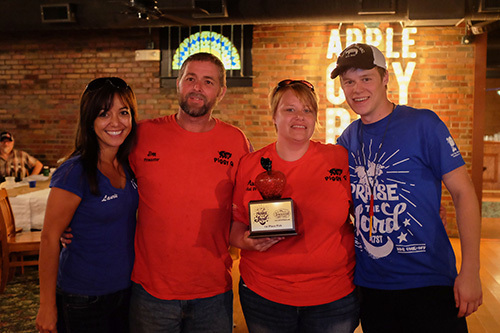 The collaboration resulted in a brew that’s been described as a “full-flavored, yet balanced, amber ale with a decidedly smoky nose and finish and just the slightest hint of sweet apple flavor.” The apple is, of course, a nod to our hometown of Murphysboro’s many apple orchards and the apple wood with which we smoke our barbecue. 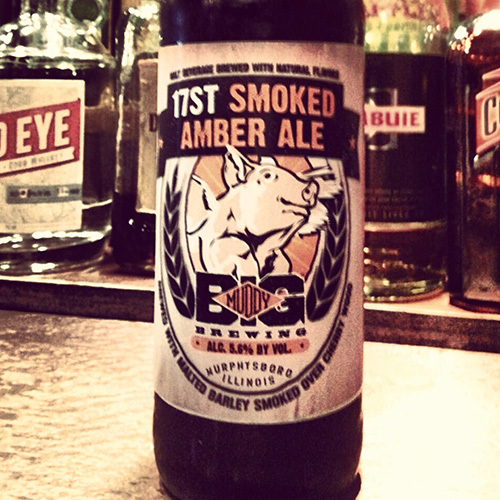 17ST Amber Ale is ranked 35th in the nation in smoked beers. We’ve had the beer on tap for almost two years and you can take home a growler from our Murphysboro restaurant. Now it’s available in 22 oz. bottles at many liquor stores in Illinois and the surrounding region. Tweet, Instagram, or Facebook us a picture if you see it in the wild! Find us @17thstreetbbq. Our signature 17ST Amber Ale t-shirt available in our restaurants and online. 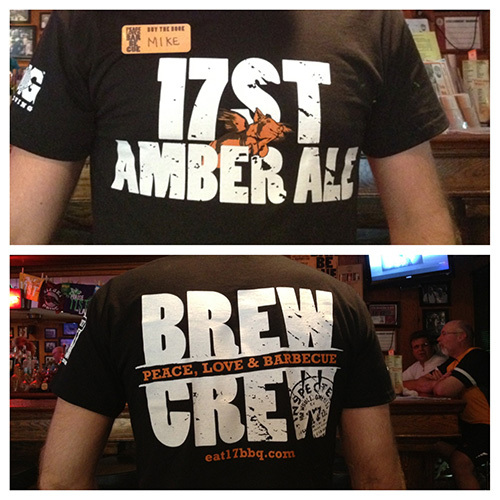 Click here to order our signature 17ST Amber Ale t-shirt.